The Thieves Who Stole Christmas: 3 Stories Of Real-Life 'Grinches' This week, Christmas gifts and decorations were swiped in Pennsylvania, Idaho and Florida. 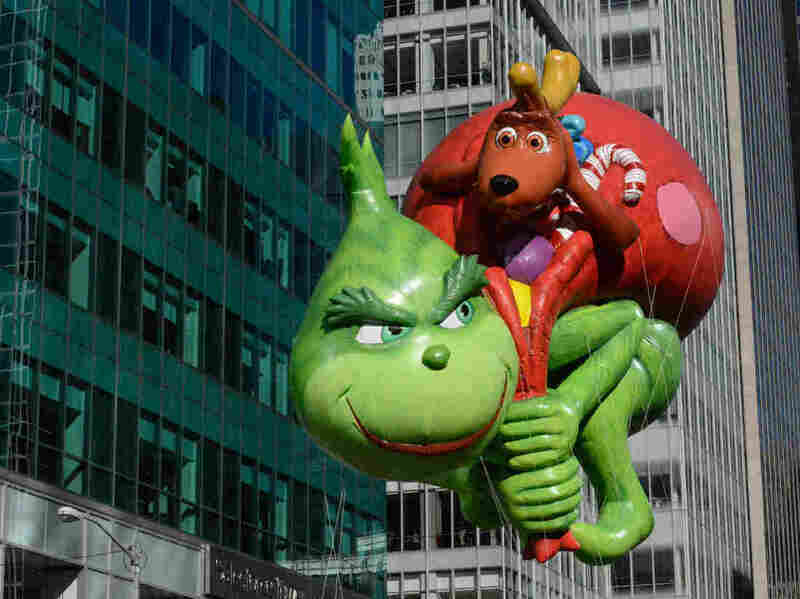 The Grinch balloon floats above New York City during the 2017 Macy's Thanksgiving Day parade. This week, real-life Grinches have been trying to steal Christmas cheer. For some, the myth of Santa Claus – a man who delivers presents for free – is hard to get behind. But a man who steals Christmas goodies? People in Pennsylvania, Idaho and Florida might find that easier to believe. This week, real-life 'Grinches' in all three states stole other peoples' Christmas cheer. In the Sunshine State, television station WPLG reports that a man swiped a Christmas wreath from a house in Hialeah. He then traveled about four miles back to his own house, where he put the stolen wreath on his front door. The 55-year-old turned himself over to authorities and faces charges of burglary and petty theft, and is being held on $10,500 bond, according to WPLG. In Philadelphia, another family fell victim to a holiday heist. Victoria Mongoni and her husband thought they'd found the perfect hideaway for their kids' presents in the trunk of the family car. "It's a good hiding place from the kids, instead of in the house someplace," Mongoni told television station WPVI-TV. But when her husband left the car running while he popped inside to get their baby out of the house, someone stole their car, and all their Christmas presents to boot. With the holiday looming, the family is in a Christmas pickle. "I can't say that Santa didn't make it. Santa always makes it," Mongoni told WPVI-TV. "I just want the gifts back, it's not so much the car anymore." Across the country in Caldwell, Idaho, another family had better luck. Two men were arrested for running off with Christmas lights that were decorating a house in the city, television station KIVI-TV reports. Luckily, most of the decorations were recovered and are in the care of the Caldwell Police department. The two men – both in their twenties – have been arrested and charged with theft, though it's unclear what their motive was. Perhaps their hearts were two sizes too small. Bah humbug! An earlier version of this story misspelled Santa's last name. It is Claus, not Clause.